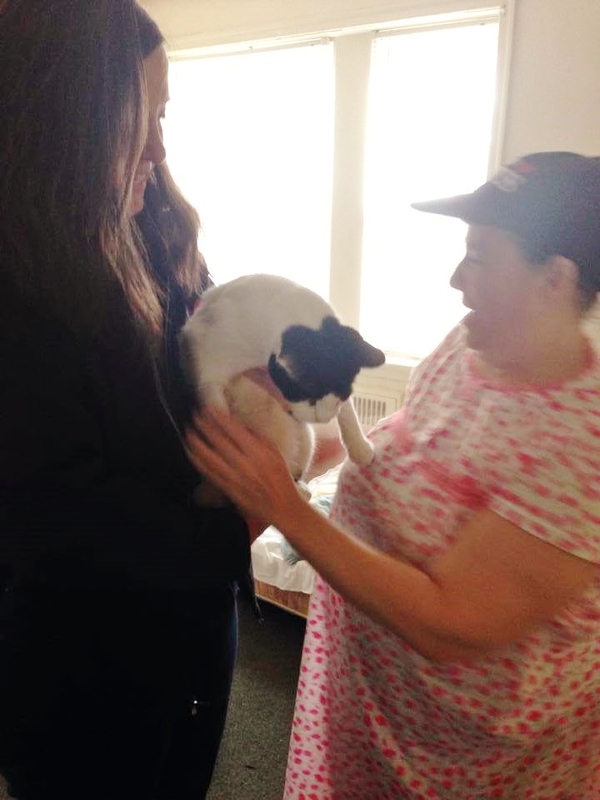 Three months after he was found following a terrible series of events, Spotty cat was reunited with his family today. 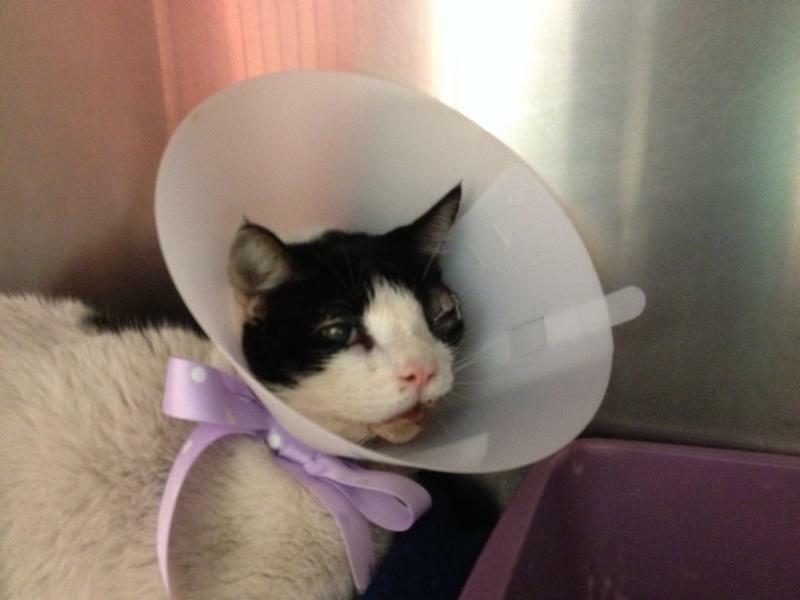 Spotty’s home burned, he went missing, and he was hit by a car. He received medical treatment and recuperated in foster care before finally rejoining his petmom, in an emotional reunion. Spotty, shortly after he was found. Spotty Cat was missing for four days after a fire destroyed his home on N. 60th St in Philladelphia, PA on October 25th, 2013, and Red Paw Emergency Relief Team was looking for him. He was discovered after being hit by a car and was brought to Ryan Veterinary Hospital at Penn Vet by a good Samaritan, covered in soot and smelling of smoke. The vet staff follow Red Paw Emergency Relief Team’s Facebook page and knew that red Paw was looking for a cat fitting the injured kitty’s description, so they called to say they had him. Spotty and his family had a very long road of recovery ahead of them but thanks to his amazing foster, Mary and his thousands of supporters Red Paw was able to cover his medical care. which totaled more than $6000, and after almost 3 months of operations and rehab, Spotty was reunited with his owner on January 19th, 2014. His canine sibling, Wolf will be reunited with him and his owners tomorrow and his feline siblings will be reunited later this week. October 29: Spotty Cat, (one of the two missing cats from our fire response on N.60th St in #Philly Friday night) has been located. Sadly, he was hit by a car last night and a good Samaritan brought him to Ryan Veterinary Hospital at Penn Vet. The awesome staff at Penn Vet knew we were looking for a missing cat that matched his description and area, saw that he was covered in soot and smelled like smoke, so they called us! Spotty Cat is in bad shape, he spent the night in an O2 tank due to smoke inhalation but his bigger issues are due to trauma from the car that hit him. He has multiple fractures in his jaw, and a severe eye injury and possible head injuries. He is going to need a CAT Scan and other tests to determine the extent of his injuries and will need surgery on his jaw, a possible feeding tube and then months of one on one care during his recovery. Unfortunately, this is not something we have the resources to handle. We have been working with the owners and Penn Vet all day to determine the best course of action for him, but obviously Spotty means the world to them and after everything they’ve been through and lost already, we want to try to do what we can to save Spotty! November 7: Still no interest in eating or drinking on his own and only urine in the litter box. Tube feeding and eye meds are a challenge! But he tolerated the increased feeding amount yesterday well. We don’t think he’s scared, he hurts and is just plain tired. Spends most of his time sleeping with his head elevated, but yesterday he was ‘caught’ resting his chin on his paw. He’s very quick to forgive and purrs a lot! 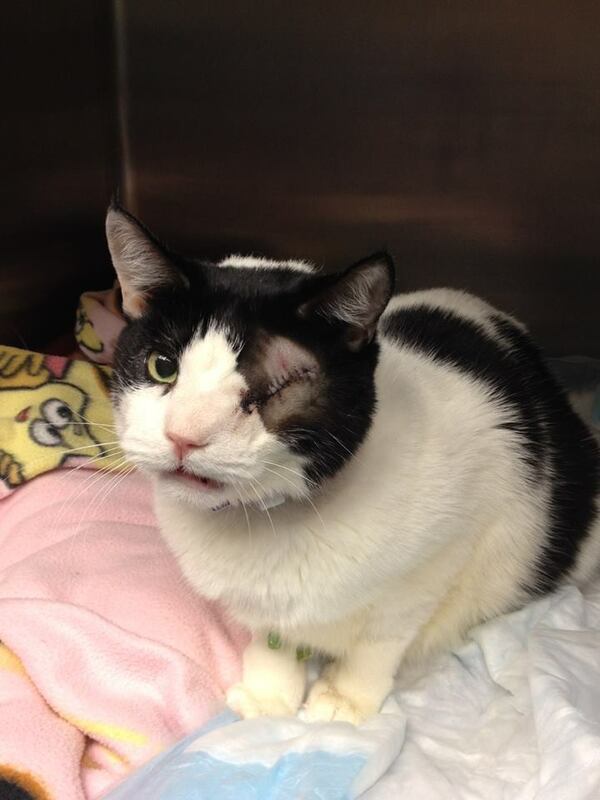 December 10, 2013: Spotty Cat had his 3rd (and hopefully final) surgery today! He is extubated, awake and doing great! The chip to his mandible (lower jaw) from the accident has resulted in his lower teeth being on the ‘wrong’ side of his upper teeth. As a result, the best thing for him was to have that quadrant of teeth removed. He also had the lower left canine removed as that was visibly poking his upper lip and a small amount of scar tissue had formed – but we couldn’t be certain that any of this trauma couldn’t result in infection going forward or was hindering him from eating. The other tooth removed was a fractured tooth from the original accident and again, the Vet’s at Ryan Veterinary Hospital at Penn Vet thought the best course of action was to remove it to prevent infection down the road. In all, he had 6 teeth removed today. The wire is out of his jaw. A small degree of instability remains but he is healing well and will be on soft foods (or continue tube feedings) for awhile anyway. Again, they truly feel he should have been eating on his own by now, and believe the above was causing him discomfort. He will stay overnight at Penn and they may offer him a small meal once he’s completely awake. He will be discharged around 9:30-10am tomorrow, barring any complications. They said he looks ‘really cute’ as a pirate (we agree! ), not so sure he will be happy about wearing his e-collar for the next 10-14 days…#pawscrossed we are now in the homestretch of recovery. 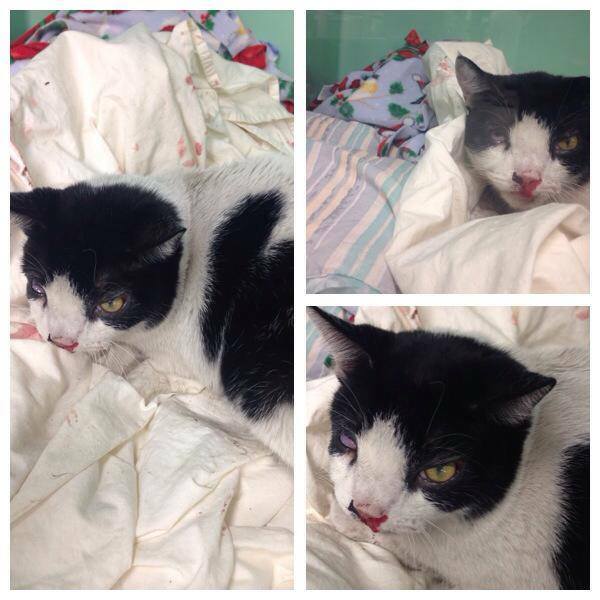 This third surgery ($2000) brings Spotty’s medical bill total to around $6000!! Spotty is reunited with his owner today.